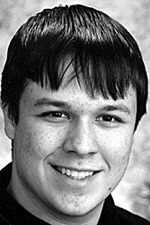 John passed away during the early morning hours of February 12, 2002 as a result of injuries sustained in an automobile accident the prior evening. This webpage, which soon will be greatly expanded by contributions from his family and friends, is dedicated to his memory. John Michael Ellsbury was born August 30, 1984, in Amory, Mississippi, to Michael M. Ellsbury and Susan (née Hansmire) Ellsbury. He lived his first six years in Starkville, Mississippi, where he attended kindergarten and the first grade at Sudduth Elementary School. He moved with his parents to Brookings, South Dakota in June 1991. John attended Hillcrest Elementary School, Brookings Middle School, and was a senior at Brookings High School. John enjoyed spending time with his friends, and he loved his dog, Arca. He was a member of First United Methodist Church, Boy Scouts, Aeromates and the Academy of Model Aeronautics. In his early years, he played the piano, violin and trombone. He had many interests, including ice hockey, kneeboarding, water and snow skiing, and computers. He was learning to fly a radio-controlled helicopter he had built. When at the family farm in Nebraska, he enjoyed cutting wood and spraying weeds. His future plans included majoring in computer engineering at the University of Nebraska. John's #33 hockey jersey and a picture of him have been placed on permanent display as a memorial in the ice arena at Brookings. The following essay was written by John the day before he died. "It was the best of times, it was the worst of times…" from Charles Dickens' Tale of Two Cities could be no more accurate and appropriate for our modern times. The quote is universal. No argument can hold solid against it, as its reasoning is backed by every aspect of humanity. Our society has been advancing steadily since the beginning; such is the nature of evolution. Technology stands most obvious as a "best of times". We can communicate near instantly to anywhere on the planet. We can travel anywhere within a day and with no physical strain. The moon and other bodies beyond our atmosphere are within our reach, and where man cannot go his mechanical creations can travel instead. Our average lifespan is as high as ever, and the "quality" of our lives, if measurable, has surely increased over the years. In general, people feel secure (in America and most major countries). Our daily activities are relatively convenient. Freedom is a high priority for many countries, and opportunities exist everywhere. With that freedom comes diversity, something with many strong values. Freedom comes not without sacrifice. More freedom for one means less for another. Diversity has its downsides. Parts of our world are good, but many are bad. Complexity may be necessary for many things today, but with complexity comes error. Often, the more we have to gain, the more we have to lose. Worldwide complexity brings conflict, and conflict can bring pain. Hate unfortunately flourishes in our diverse world. Hate of people, hate of ideas, and hate of all things is one of the ugliest faces of humanity. Crime is an issue everywhere. The technology used for security can also be used against it. Violence and war still continue around the world, and the potential for such problems is exorbitantly greater than before, particularly in nuclear capacity. Our society literally has the ability to destroy itself, a very unsettling concept. Still with the comforts of technology comes laziness and naivety. People tend to forget "what falls through the cracks". Specifically, areas where development is centuries behind are ignored by those people in better-suited countries. This ignorance is underestimated, and one day it may prove our downfall. There are too many positives and negatives for any one human to understand, and many more issues fall in the middle. Because of this immense concept both best and worst can be used to describe our world. With no way to measure either way, all that is known is that both good and bad exist. One may focus on one or the other, playing the optimist or the pessimist. But really, the wisest position is to accept both, but to see to it that our aim is always to the best. This defines humanity. As long as imperfection exists, the potential for good will stand solid.